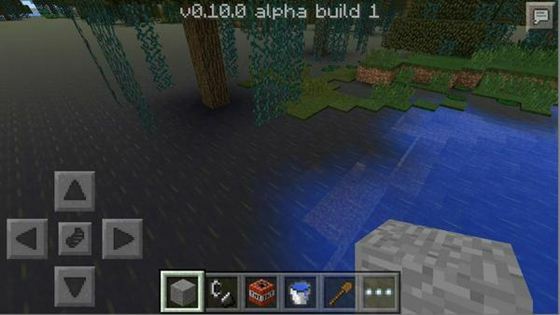 Hey, how's it going, guys, welcome to view the new material on Minecraft Pocket Edition, namely 0.10.0 update! Today I am going to tell you about me known information regarding the update 0.10.0. Do not forget that all seen or heard you can change at any time, regardless of the decisions of developers. Let's finally move on to the fun part! What does this mean? As you know, at the moment the beta version is still closed. 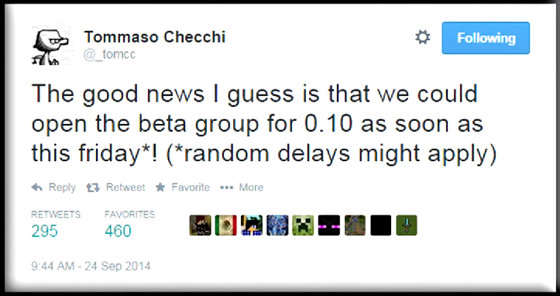 So, apparently, the team encountered some difficulties and they had to postpone the release of the beta. Now they have all thoroughly tested, to bring to perfection, and only then will open access to the beta. 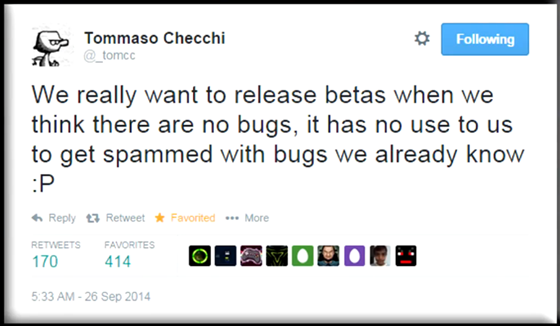 So, they want to first fix all known bugs in the game to them and only then will release a beta version to the players to test it for bugs, which the developers are not aware of. After that they will bring this version to mind, and then release the long awaited update to iOS as well as on Android. Full release update was supposed to take place next week, or next week, depending on how much developers will move to error correction. And another news - beta will be available only to owners of devices supporting OS Android. The main reason for this is the fact that Apple has no relation to the developers of the game, which, believe me, we would like to release a beta version for all possible devices, so that more people could test the game and reveal as many errors. After all, it is logical - the more people testing the game, the more bugs will be found and eventually the beta stage will be faster and more successful. Unfortunately, due to the limitations imposed by Apple, beta on iOS will not. At this time. Perhaps in the future, but we can not be sure of this. Nevertheless, with regard to gameplay and game features in the new update, Tommaso wrote something else on his Twitter account, moreover, he stuck to his video recording. A kind of teaser for MCPE version 0.10 and I'm going to show you this video right now. Recorded for this video, he said that added a bit of "magic" to the water and the sun, so that they look a little prettier. Magic - it's shaders that were finally added to Minecraft Pocket Edition and it looks absolutely phenomenal! Also marsh biomes have been greatly improved in terms of aesthetic. 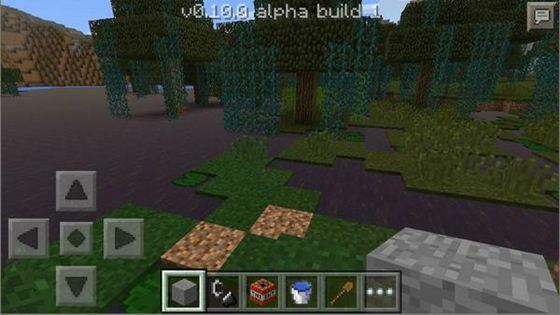 As you can see in this picture, swamp biome has become a darker shade, the water looks greenish and that's just fine, because now it will be much easier to find marsh biomes. Update itself almost does not add new features of the game, it is rather an aesthetic update. Unfortunately, the developers also said that they are not sure about the introduction of the boats in this update, and I believe customization of skins for the characters and not yet finalized. But that's OK, because the game will be much more pleasant to look externally. I also hope that they will work hard to improve the performance of the game, because that's what they talked about for quite some time - reducing the distance drawing landscapes and caves to the game to work much faster, I hope, as we wait. Factorisation 2.7.1 for Minecraft Pocket Edition 0.9.5.2 (+texture)That's quite a small update Factorisation 2.7.1 for Minecraft Pocket Edition 0.9.5.2!